Monkey Shoulder ($24) – I didn’t know that this was produced by Glenfiddich. I’ve had it before and was quite impressed, but this time I actually get to take some notes. The nose is pretty simple, yet good with honey, apple and caramel. The taste is fruity and spicy with notes of ginger, apple, pear, vanilla, fresh cut straw before the finish becomes white pepper, ginger, honey and straw. This is a simple, yet good whisky with a good feel, mild complexity and mild tannins. This is my bargain blend choice at the moment and I’ll continue to recommend it to bargain scotch drinkers. 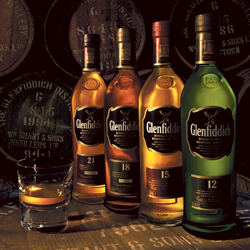 Glenfiddich 12 Year Old ($35) – This is aged 15% in ex-sherry casks and 85% in ex-bourbon casks. It’s spicy with a mildly sweet taste and a fairly long finish. I smelled caramel, vanilla, apple, peach and orange marmalade. The taste was of cocoa, vanilla, ginger, tobacco, overripe peach and apple joined by black pepper on the finish with the ginger and cocoa being the main player from the initial taste. This is a solid whisky for sure and a good bargain. Glenfiddich 15 Year Old ($50) – Similar to the 12 year old, this is a combination of ex-sherry and ex-bourbon casks at 20% and 80%, respectively. It has a medium mouthfeel with a mildly woody and fruity finish giving it a fairly tame approach while maintaining a nice balance of fruit, wood and spice. The main notes are of plum, vanilla, prune, lemon drop, ginger, straw and apple with a mildly leathery finish of fruit and spice. There’s a lot more competition in this price range and this is not enough of an improvement over the 12 Year Old to recommend. If you like the 12 Year Old and want to taste a bit more wood from the aging, then this might be worth a shot. Glenfiddich 18 Year Old ($79) – The same 20% ex-sherry cask aging as the 15 Year Old is applied to this older offering. It’s definitely an improvement over the 15 Year Old, with more complexity and presence, while maintaining the same good balance. A simple nose of vanilla, plum and straw don’t do justice to the more complex tastes of ginger, orange, pear, black pepper and green pepper before transitioning to a nicely balanced finish of wood and spice with a good mouthfeel. This was the best regular offering of the night, but it’s a bit hard to opt for this with the likes of Glendronach 15 Year Old Revival or Balvenie 15 Year Old Single Barrel at about the same price. Glenfiddich 21 Year Old ($160) – Glenfiddich opt for a rum finish on this one and it only works marginally well. It’s fruity with a bit of pear, overripe apple and bitter orange, but it’s got a light finish that just doesn’t work. This is a definite pass! If you want to experience a rum finish, then get Balvenie’s 14 Year Old Caribbean Cask offering. Glenfiddich Age of Discovery ($150) – This limited 19 Year Old offering is still available, but it’s not as good as their Cask of Dreams and cost $50 more. The spices overpower the fruit, vanilla and honey, completely ruining the good start. As a result, you end up with an somewhat average whisky that lets you down at the end, when it counts most. Don’t bother with this one! Glenfiddich Vintage Reserve 1974 ($800) – Easily the best pour of the night, this is a limited 36 Year Old offering that we were fortunate to experience. The nose revealed honey, vanilla, straw, pear, apple and pomegranate, indicating that this was in another league compared to the rest of the lineup. The taste was every bit as interesting with pineapple, orange marmalade, plum, honey, straw, lemon and ginger. Much of the spice and fruit carried over into a great finish with a nice rich feel to it. Overall, this is a well balanced and flavorful offering that I’m glad to have experienced. This was another fun night at Trinity Hall and opened my eyes to the Glenfiddich line, which I might not have tried otherwise. The 12 Year Old is one that I’ll recommend in the price range along with Monkey Shoulder at the lower price point. Posted in Whiskey. Tagged Blended Malt, Glenfiddich, Single Malt. Red Label ($18) – Made mostly from Carhdu whisky (owned by Johnnie Walker), this is a light, peaty whisky with an aroma of mild smoke, malt, straw, honey and a taste that is grassy with mild peat, honey, apple and pear. The finish is light and mildly leathery with lingering peat. I’m really surprised at the amount of peat in this whisky and it’s not a great combination with the light and spicy flavors that can’t stand up to it. 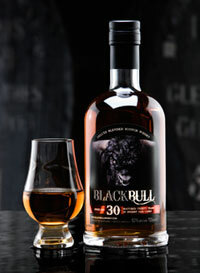 Black Label ($27) – A blend of 40 whiskies with 12 year minimum age and the best seller in the JW line. The nose is very good with honey, fruit and feint peat, while the flavors are fruity and mildly spicy with a bit of peat and vanilla. The finish is dry fruit, mild leather, mild spice and honey rounding out a mildly rich experience with nice mouthfeel and a good balance of sweet and spice. This is nice whisky for the price and I’m surprised at how much I liked it. Double Black ($32) – This is the newer No Age Statement Black Label offering/replacement. It was previously a seasonal offering, but is now permanent. It’s definitely similar to Black Label, but with less depth and a thinner mouthfeel. Skip this one, go for Black Label and hope that JW doesn’t discontinue it like Green Label. Gold Reserve ($70) – Made up of whisky from Clynelish and Caol Ila distilleries, Gold Reserve (replacement for Gold Label) has a nice nose of plum and honey. The taste is consistent with the nose with notes of honey, vanilla, ginger, peat, plum and pear, giving way to a mildly peated and leathery finish with a bit of spice and honey. It’s light and flavorful with a light mouthfeel… more of a summer whisky. Blue Label ($182) – This is the premier offering from JW and one I’ve been looking forward to for a long time. It doesn’t disappoint with some cherry, plum, apple, pear, honey, peat and straw on the nose and a richer taste of caramel, vanilla, honey, peat, black pepper, ginger and orange. 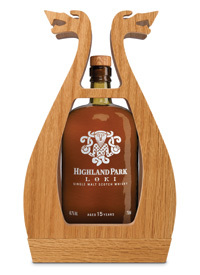 The finish is sweet, fruity and spicy resulting in a very nicely balance whisky and plenty of flavor. If it weren’t so expensive, I could enjoy this one. 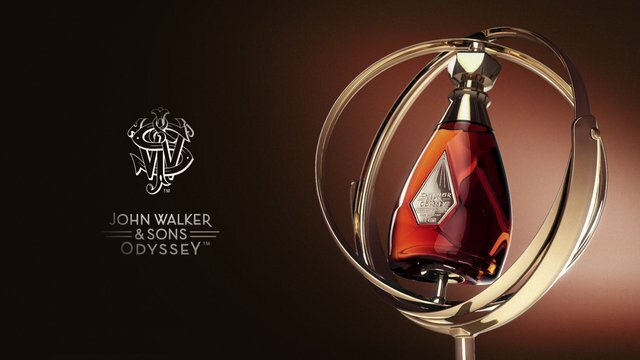 Johnnie Walker & Sons Odyssey ($1,100) – Marius (Trinity Hall proprietor) secured a bottle of this limited offering that is a blend of 3 malts in a fancy crystal bottle that rotates 360º while in the box. It has a great nose of vanilla, plum, honey, cigar box, straw and mild peat. The taste is similar with notes of plum, ginger, pomegranate, honey, vanilla, caramel, orange marmalade and light tobacco before transitioning to a light and sweet finish. This is the standout of the night with a great nose and a rich, complex taste. At this price, I would expect no less! I’m glad to have finally sampled the Johnnie Walker line. Previously, I had only tasted the plentiful Black Label, which I didn’t remember being as good as I discovered tonight. It was by far the best value of the entire line and well worth the jump up from Red Label, which I wouldn’t bother with at all. While Odyssey and Blue Label were impressive, their prices were much more so and put them out of consideration for sure… they’re just not worth the cost of admission. As good as these whiskies are, there are much better ones available for much less money (Black Bull 12 and Glendronach 12 to name a couple and Odyssey has nothing on Glendronach 15 Revival at around $80). Johnnie Walker has quite the following and they appear to offer great consistency from year to year, which is important to plenty of people, but I still don’t see the value above Black Label. I’m an explorer and easily bored with the same whisky night after night, so I have no daily dram to speak of. There are plenty of whiskies yet to explore and I’m glad to have sampled these along the way. Given an opportunity like this one, you should too. Posted in Whiskey. Tagged Blended, Blended Malt, Johnnie Walker. I’ve been meaning to try something from Compass Box for a while and encountered this one on day 6. It smells of grapefruit, vanilla and caramel with a touch of grass and a whiff of very light smoke. The taste is saturated with wood, beginning with a complement of grapefruit and vanilla toffee, the transitioning to bittersweet honey and finishing with leathery pepper burn. The burn fades reasonably quickly at the front of the mouth, but continues to burn in the back of the mouth and throat. The bitterness fades to a dull taste of oak and leather. This one is spicy throughout the experience and any sweetness is quickly vanquished by the woody characteristic. We call this whisky Oak Cross because it offers the best characteristics of both American and French oak aging. A rich, medium-bodied blended malt Scotch whisky, Oak Cross combines vanilla characters from American oak and spicy, clove-like characters from French oak. Posted in Whiskey. 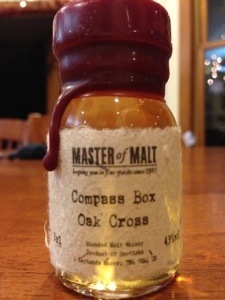 Tagged Blended Malt, Compass Box.